Guyana achieved a trade surplus in 2010 with the US, exporting US$298.6 million of goods while importing US$290.4M, U.S. Ambassador D. Brent Hardt noted recently, while asserting that trade offers a main avenue to expand economic opportunity. Ambassador Hardt, in remarks to the Rotary Club of New Amsterdam last Saturday, pointed out that in 2010 Guyana traded more with the United States than with any other country in the world. He observed that Guyanese products such as apparel knit with American-made material, sugar, seafood, fruit, and other agricultural products enjoy duty-free access to the U.S. market under the Caribbean Basin Trade Partnership Act, which was extended to 2020. Hardt, who was sworn in here as Ambassador on August 19 last year, told the Rotarians that partnerships in democracy and governance, economic development, citizen security, and public health represent the pathway that the United States is walking together with Guyana. “To make the most of my country’s unique strengths to achieve these goals, we are seeking to engage other countries, including Guyana, in a spirit of partnership. 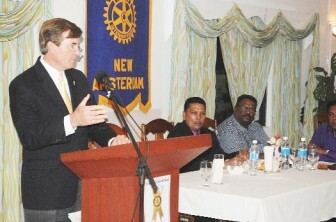 We seek a partnership with Guyana rooted in our shared values of democracy, liberty, justice, and opportunity,” Ambassador Hardt said, according to a copy of his remarks delivered during his meeting with members of the New Amsterdam Rotary Club. Hardt pointed out that to help ensure Guyana’s export and import numbers continue to grow, the United States is engaged in a number of economic initiatives throughout Guyana. “Our USAID Guyana Trade and Investment support, or GTIS, project encourages local businesses to explore new export and business opportunities in non-traditional sectors such as agriculture, eco-tourism, wood products, and aquaculture,” the ambassador said. He also noted that within the agriculture sector, the GTIS programme is helping to link Guyanese farmers with larger producers and exporters to expand their export capacity. These links, he explained, are also generating a transfer of technology such as greenhouse farming, drip irrigation, and integrated farming techniques, while increasing agricultural production. And looking at the U.S. vision for a partnership in effective and accountable institutions of governance, Hardt noted that in recent decades the Western Hemisphere has seen a transformation from a region with autocratic governments to one where democracy is the norm, even if democracy is under pressure in some countries. Guyana, he said, has been a part of this hemispheric transformation and its recent elections reflected the commitment of the Guyanese people to the democratic values of tolerance and inclusiveness. Hardt mentioned also that especially since 1992 when former President Jimmy Carter played an instrumental role in restoring democracy in Guyana, the United States has been working as a partner for building accountable and transparent governance and stronger democratic institutions. “We were pleased to have been able to work hand in hand with the Government of Guyana, with GECOM, with non-governmental groups such as the (Electoral) Assistance Bureau, and with the media and civil society to promote free, fair, transparent, and peaceful elections in 2011,” the U.S. ambassador said. They also supported voter education outreach, election observation, and media code of conduct training. In that regard, he said he applauded the efforts of the new Speaker of the National Assembly and its members to bring the Assembly closer to the people, making it more accessible while building popular understanding of the Assembly’s vital legislative and oversight roles. And with all political parties agreed on the need for such elections, Hardt declared that the United States would support this vital step forward in Guyana’s democratic evolution. However, the ambassador acknowledged that while democracy’s foundation lies with creating an open space for individual opportunity, it is also reinforced by expanding economic growth and broad-based prosperity. In the light of economic opportunity, Hardt singled out eco-tourism as another sector where the United States is working with local partners to expand and improve markets within Guyana. “Tapping into Guyana’s clearly emerging attraction as an eco-tourism destination, U.S. initiatives have helped attract high-end visitors who want to enjoy the vast diversity of Guyana’s wildlife, whether through birding or sport fishing. The very healthy growth within the eco-tourism sector has provided employment and income for not only those in the tourism sector but for indigenous communities as well,” Hardt said. Another fruitful area for economic partnership, the U.S. ambassador contended, is the evolving nexus between Diaspora communities and their countries of origin. While Diaspora communities have long supported families in their countries through remittances, there are additional ways that the great store of talent, energy, and entrepreneurial spirit within the Guyanese Diaspora can be engaged to contribute to the development of their countries of origin, Hardt remarked. To this end, he said that Secretary of State Hilary Clinton had introduced the Caribbean Idea Marketplace (CIM) to build on this potential. The Idea marketplace will offer grants to members of the Caribbean Diaspora who propose projects that can create employment and economic development in their countries of origin. “This and the other economic partnerships I have highlighted reflect the United States’ firm commitment to supporting a prosperous Guyana and building prosperity and better understanding within the Hemisphere,” the ambassador explained. He also looked at crime and violence within the Hemisphere, which he said represent the greatest threats to the security of citizens, adding that the only way “we can succeed in ensuring the safety of our people is by working together and adoptin g a comprehensive approach.” Consequently, he pointed out, U.S. President Barack Obama launched the Caribbean Basin Security Initiative, or CBSI, at the Summit of the Americas in Trinidad in 2009. Hardt also argued that one of the strengths of the CBSI is that it does not only seek to deal with the consequences of crime, but actively seeks to address the root causes of lack of jobs, skills, and opportunity for young people. And in Guyana, he said, USAID is actively developing a new skills training programme for young people to complement other ongoing initiatives launched by the government in this area. Ultimately, Hardt added, the CBSI’s success will depend on continuing commitments from all CBSI partners as well as the assistance of other international donors. “It will require countries to ensure their law enforcement authorities are well-trained and funded, that they are vetted to ensure integrity, that investigations lead to effective prosecutions and convictions, and that laws are updated to ensure authorities can operate on a level playing field with rapidly evolving criminal enterprises,” he said. Another important area of citizen security in which the United States is actively engaged in dialogue with Guyana is the combating of Trafficking in Persons, or TIP. The issue for all countries, including the United States, Hardt contended, is not how many cases of TIP are occurring, but what is being done to combat the incidents of TIP. He cited a recent seminar on Combating Trafficking in Persons held by the U.S. Department of Justice in Georgetown as contributing to building understanding on this vital issue while examining what steps can be taken to improve anti-TIP efforts in Guyana. The ambassador also hailed what he called the “extraordinary partnership” between the United States and Guyana to advance public health for the people of this country through the PEPFAR programme – the President’s Emergency Plan for AIDS Relief. PEPFAR, he highlighted, has supported Guyana’s “impressive efforts” to reduce the incidence, and care for victims of the debilitating epidemic. Meanwhile, the United States has provided close to US$150 million in assistance so far to boost the capacities of the Ministry of Health and non-governmental organizations to provide greater access to life-saving medications, build technical capacity, provide cervical cancer screening, and reduce stigma and discrimination, Hardt said. He also acknowledged that the Rotary Club has made a significant impact with their longstanding efforts to eliminate polio and donations of medical support services to communities and individuals alike.